::Download Scientific Description:: ::Project Researchers and Highly Qualified Personnel:: ::Project Progress Summary:: ::Project Scientific Summary:: This project is related to the development of solar cells based on semiconductor nanowires films. 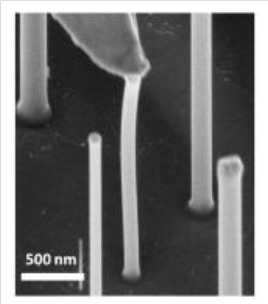 A nanowire film looks “hairy” because it is composed of many tiny “wires” that extend upwards as opposed to being uniformly flat. There are several advantageous to this approach, such as improved optical and electrical properties, currently being explored in the scientific community. The semiconductors under study in this project are a family of materials known as III-V compounds (III-V indicates that the materials that form the compound come from Group III and Group V of the periodic table). The alloys of particular interest are InGaN or GaAs. Figure: Amazingly, a single semiconductor nanowire is contacted directly with an external probe. Nanowires are a promising new material with potential for photovoltaic applications being studied in Project 09. Quite uniquely, InGaN is the the only semiconductor alloy whose energy bandgap can be continuously varied across nearly the entire solar spectrum depending on the ratio of each element in the alloy. This means that a solar cell based on an InGaN alloy can be tuned to produce maximal power when absorbing any given portion of the solar spectrum, be it short-wavelength blue light, intermediate-wavelength green light or long-wavelength red light. This may make it particular useful for so-called multi-junction solar cells where a stack of solar cells are used to ensure that each colour-band of light (red, green or blue) is optimally absorbed. 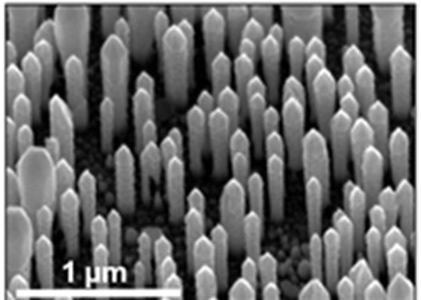 Figure: 45°-tilted scanning electron microscope images, showing the morphology and orientation of the InN/InGaN nanowires grown on a Si (111) substrate. However, the achievement of high quality InGaN materials has remained difficult, due to the lack of suitable substrates upon which to grow the nanowire films and the large mismatches in the crystal dimensions between InN and GaN materials. In this project, we intend to develop nearly dislocation-free InGaN nanowire heterostructures on Si and further investigate their applications in solar cells (Zetian Mi, McGill University). Similar work will be extended to GaAs and related III-V compounds (Ray LaPierre, McMaster University and Simon Watkins, Simon Frasier University).